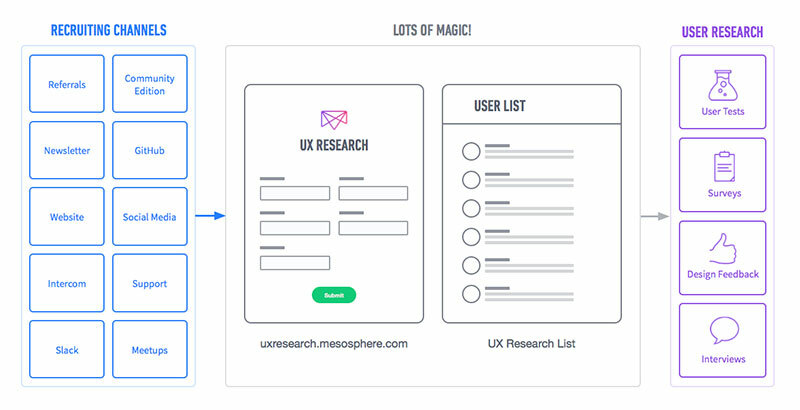 UX research is a core component of a successful product design process. It helps you build empathy with your users and understand their behavior and problems. And then it enables you to test out your solutions and confirm hypotheses. One of the key methods for a successful UX research process is user testing. Time. 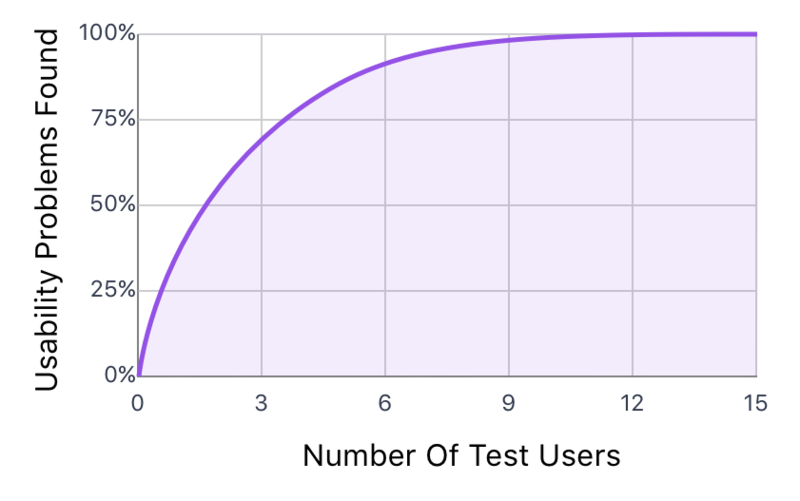 The time it takes to recruit, schedule, and run the tests. Money. Paying participants incentives or paying 3rd parties to run tests for you. Fear. Fear of being wrong or of introducing changes late in the dev cycle. User testing doesn’t have to cost a lot of money. You shouldn’t be fearful of hearing the truth about your designs. But no doubt it can take up a lot of time. The thing that has deterred me in the past is the time and effort it can take to recruit and schedule. I’ve been an early designer at several startups, so I have a lot of experience championing regular user testing. 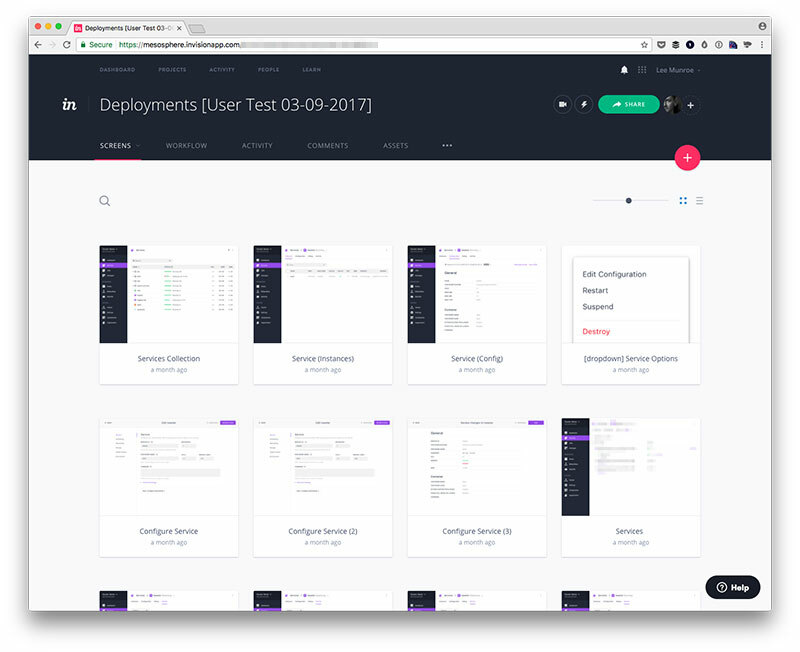 When I joined Mesosphere, I worked with the team on a system that would help automate and encourage our design team to run user tests every 2 weeks. For some context, Mesosphere is a B2B software company. We have an enterprise product called DC/OS (Data Center Operating System) that helps software companies build and run modern apps. We also have several open source products with several thousand users. This is how we set up our user testing program. Instead of waiting until you’re ready to start conducting user tests, start collecting interested users now. This way you have a bucket of people to call when you’re ready. The first thing we set up was a form to capture leads for UX research. If they opt in to our list, we have permission to email them about upcoming user testing sessions. We can also reach out to them for surveys, prototype feedback, interviews, and field visits. We initially used Google Forms to set up the form, as it was quick and easy. Then we shifted to Pardot so we could integrate our list with Salesforce (which other teams are using). 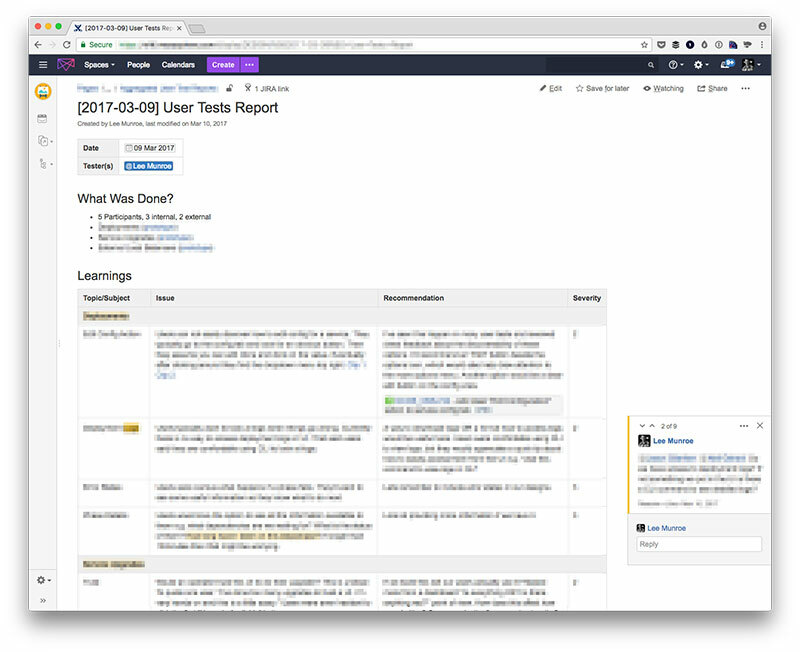 More recently we’ve been using Ethnio, a service made specifically to handle user research recruiting and scheduling. The tool you use here isn’t important. The goal is to create a list of people who are interested in user testing. Then you have them to call upon when you have something to test. There’s a balance in how much information you ask for in your opt-in form. We want to make it short so users complete it, and we also want to find out as much about them as possible so we can qualify them. Phone number. This comes in handy when you need to confirm with the person that they still intend to show up for user testing. Technologies used. This helps us filter our list down to the type of persona we’re looking for certain tests. Local to San Francisco. We use this to help us find good candidates who can attend user tests in person instead of remote. 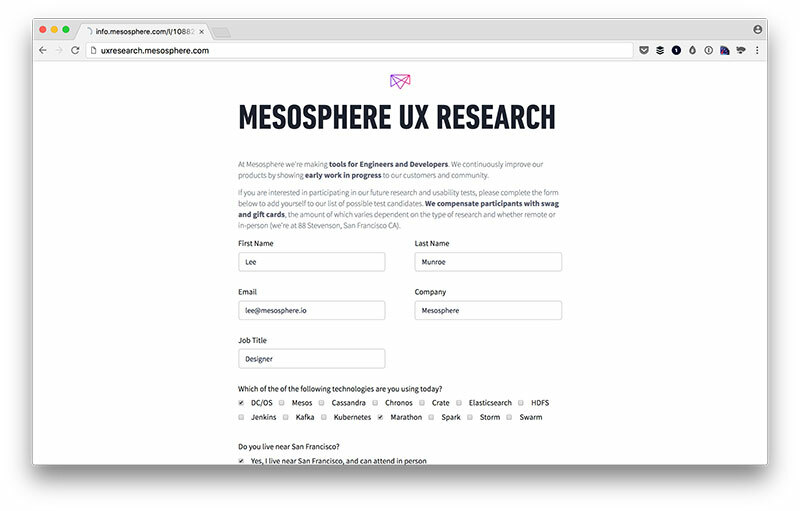 Once we had the form set up, we created the subdomain uxresearch.mesosphere.com so we could easily point people there. Then we set up some inbound channels to start collecting these people. We set aside every other Thursday for user testing which forces us test something. 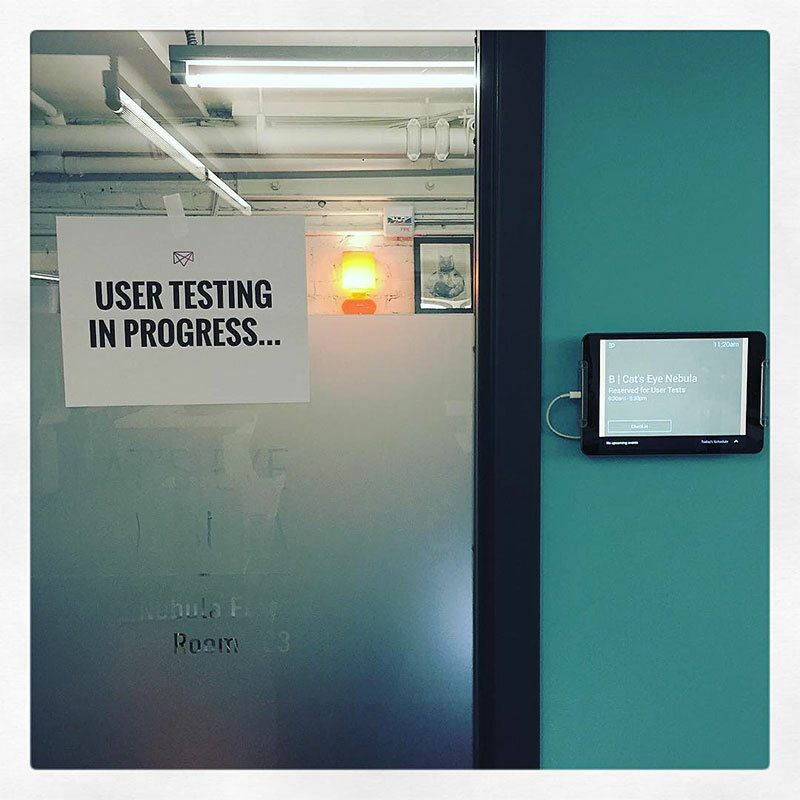 Each user testing day has a designated test lead. This will be one of our designers and we’ll take it turn about. It’s their job to facilitate and run the tests that week. What are they doing today? Interview style research to help us understand their current workflow or problems. Would they use this? Hybrid of interview and design artifacts to get their reaction to something we’re working on. Can they use this? Usability test on a clickable prototype or coded solution. We make heavy use of InVision prototypes here to make sure we’re confident about our solutions before we develop anything. The test lead works with the broader team to align on what we want to test and prioritizes the key things they want to focus on. We’ll typically meet the Monday before a test to discuss what’s on the list of things we want to test. This list usually comes from design and product, but it can also include things from engineering and docs teams. Once we understand the key things we want to test, we’ll work together to come up with a high-level script and tasks of how might be best to test this. The person who wanted the testing done then comes up with a more detailed script for the test lead. 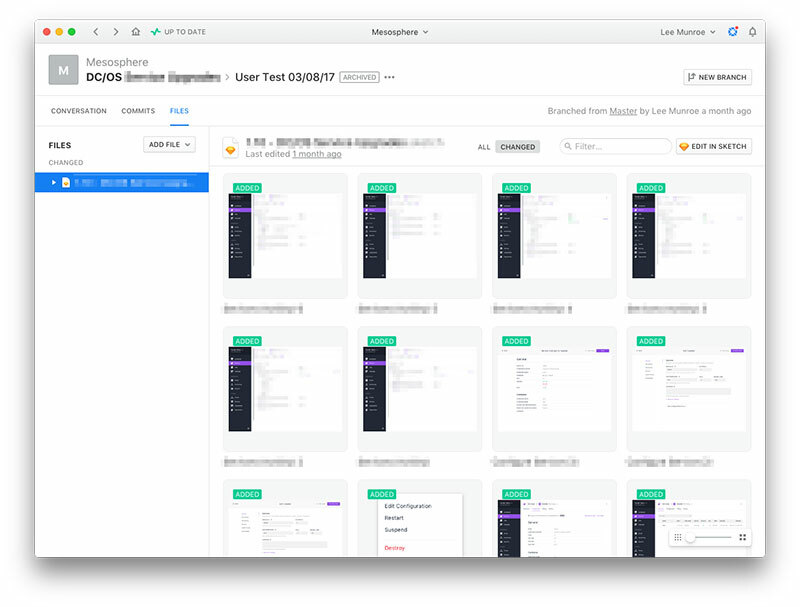 When we’re testing clickable prototypes, we use Sketch and InVision, and we use Abstract to manage our design files. We’ll typically branch off from the main project and create any additional screens or add content to help it make sense on the context of the task we set. Then we’ll create a separate InVision prototype so we don’t confuse other team members with those screens that are specifically made for the user tests. Our goal for scheduling is to have 5 user tests in a day. We have 5 slots, each lasting one hour: 10am, 11:30am, 1pm, 2:30pm, and 4pm, with a 30-minute buffer between each to prepare for the next. We believe in Nielsen’s law of diminishing returns. Five user tests should be enough to highlight the main issues that we need to fix. Any more tests isn’t time well spent. When we plan for 5, we make sure we have 1-2 backups planned. Usually we’ll have someone internal on standby so when someone cancels (there’s always one) that person can step in. We still get good feedback—and that means our time didn’t go to waste. These tools let us create a page with time slots, and then our users choose a time that works for them. They also help us manage messaging and reminders for the appointments. This is a big help. Recruiting and scheduling takes up a lot of time. After our designers did this a few times, we asked for help from one of our executive assistants. Thankfully they were able to allocate some of their time to running this for us (thanks RJ! ), and they even helped optimize the process. I can’t recommend this enough, as it means less for our team to think about in terms of operations—and we get to spend more time working on the designs and script. On the day we actually do the user test, we greet the user, have them sign a waiver, and bring them into the testing lab. In the lab, we’ve already set up a MacBook that has tabs open for everything we plan to test. We use ScreenFlow to record the sessions and hook it up to a big screen so we can watch. We have no more than 2 people in a room: the test lead and either another designer, PM, or developer who takes notes. Personally I love when developers join because they get to see problems in person—and then they’re sold on fixing them. What websites do you like to visit daily? What news did you read this morning? Starting with the Google homepage ensures they don’t get immediately distracted by cool new features and start clicking around. Instead, they’ll listen carefully to what you have to say and to what the task is. Remember, most people haven’t done this before and don’t know what to expect. You’re playing host, so it’s important to make them feel comfortable and get to a point where the conversation flows. What would you expect to happen if you did that? Can you explain what just happened? Tell me about the last time you had to perform a certain task. The script we put together serves as a guideline. It’s important not to stick exactly to the script. If the user goes down another path, it might be worthwhile continuing down that path then circling back to where you left off later. Finish by asking them if they have any questions, and if they could wave a magic wand and have any feature today, what would it be? This helps us build a list of feature requests, and it makes the person feel good that we’re listening to their feedback. After the test, express your thanks and send a gift card (we typically offer Amazon gift card incentives). This is also a good time to ask if any teammates would be interested in coming next time, or to schedule a field visit at their office. While we prefer in-person tests, remote tests are also valuable. These are easier to organize since the person doesn’t have to travel and you’re not dependent on your location. Reminding the person beforehand that they should be in a quiet room with a good internet connection is a good idea. Things get awkward when they dial in from a busy coffee shop. Take your raw notes, create a report, try to keep it brief, and highlight the main issues you discovered. Our reports outline the top issues, and we assign a priority of 1-4 to them. It’s important that this report is digestible by others in the company, so we spend time cleaning it up and making sure the key issues are called out. Share the report with anyone who’s interested. We share it with engineers, product team members, and designers across the company via Slack and email. Discussion happens through comments on the wiki between designers, developers, and PMs. We also add tags to our reports so that we can easily search them and pull them into future project wikis. The most important thing: take action on what you discover during user testing. There’s no point doing all this if you don’t actually make changes to make the product better. Sounds obvious, but often this part gets skipped as this is where you need to get buy-in across the broader team. If you can show clips of users struggling, it’s an easier sell to developers, stakeholders, or whoever needs convincing. And like I mentioned before, having developers and PMs sit in on a test helps to create the empathy needed fix some of the issues you discover. User testing isn’t straightforward. It takes time, effort, and patience. But every session we run brings so much value. 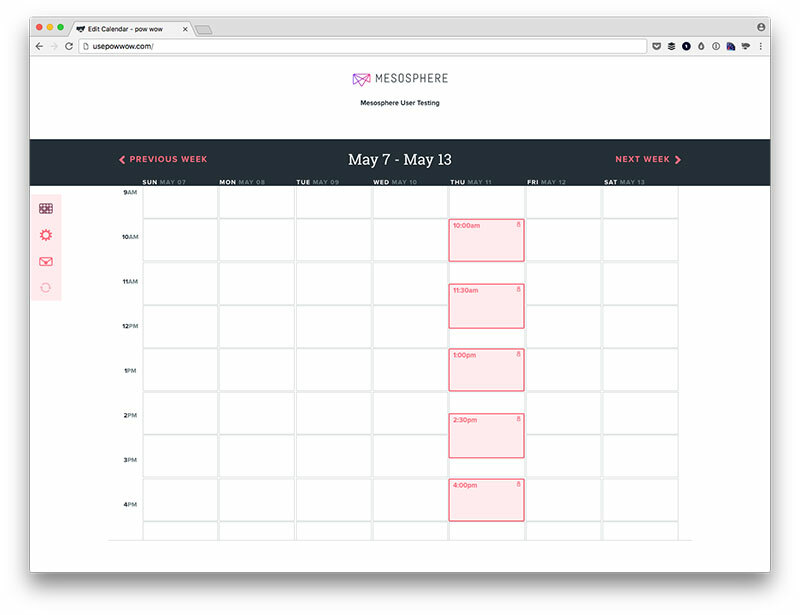 Follow Mesosphere Design on Dribbble and Twitter to learn more about what we’re working on. We’re also hiring communication and product designers. Want to try out user testing? InVision has partnered with leading user research platform UserTesting to give InVision users a faster, more seamless way to capture insight into their app, website, or prototype. Learn more here. Lee is a Product Designer and Developer based in San Francisco. He has several years of experience leading design teams and building developer tools. He also built HTML Email and open sources email tools on GitHub.